How Much Breast Milk Should You Be Able to Pump? Are There Supplements to Increase Breast Milk Production? Can You Pump Breast Milk Before a Baby Is Born? The World Health Organization and the American Academy of Pediatrics both encourage mothers to breastfeed as the best source of nutrition for their babies. But some either can't breastfeed because of difficulties getting their babies to latch or choose not to breastfeed for various personal reasons. Pumping breast milk can offer these mothers the best of both worlds, allowing them to give their babies the best nutrition with the convenience of using a bottle. 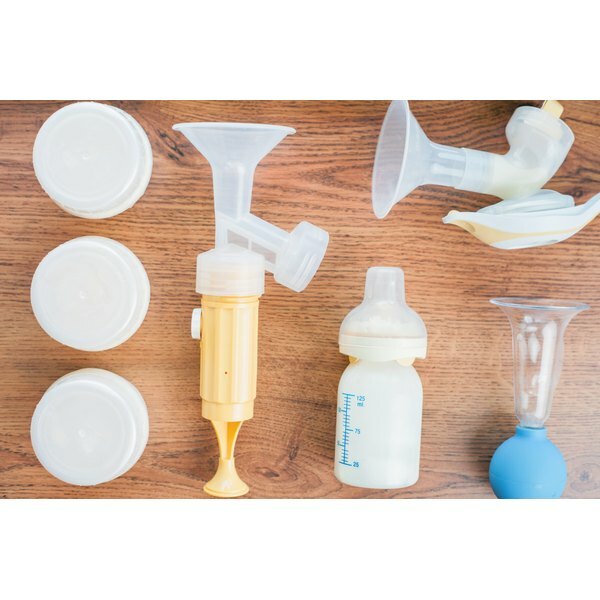 Breast pumps don't extract milk as efficiently as a baby does, so you risk a dip in your supply by pumping. But you can increase your output by choosing a quality pump. Pediatrician Dr. William Sears told "Parenting" magazine that the hormones responsible for milk production are increased when both breasts are stimulated at the same time, so choosing a double pump can help you get more milk. Dr. Sears says that double pumps are also more efficient, extracting more milk in less time. Look for hospital-grade or rental-grade pumps, which are powerful electric pumps that simulate the natural sucking motion of a baby. The pumps can be expensive, so mothers on a budget may want to consider renting one. Newborns typically nurse every two to three hours, which encourages the breasts to increase milk production to meet the baby's needs. Mothers who are exclusively pumping may need to pump more often, since a breast pump is not as efficient at stimulating the breasts. Dr. Sears recommends pumping for short periods at least every couple of hours. However, women who notice a dip in supply can increase their pumping sessions to increase their milk supply. The more you pump, the more milk you will produce. If you experience a drop in supply while pumping, or if you are having trouble collecting more than an ounce or two during each pumping session, there are several things you can do to increase their supply. KidsHealth.org says you can improve your milk letdown by looking at a picture of your baby when you pump or holding a blanket or favorite toy of your baby's. Drinking plenty of water and pumping in a relaxing environment can also help increase output during pumping. Eating a proper diet, getting enough sleep and quitting smoking can all help to increase milk supply as well. Proper milk storage and handling are critical to the safety of babies who are fed pumped breast milk. KellyMom.com says that breast milk remains fresh at room temperature for four to eight hours, and it can stay in the refrigerator for three to eight days or in the freezer for six to 12 months, depending on the temperature. Once milk is thawed, it can remain in the refrigerator for 24 hours, but it should not be reheated or frozen again. Milk should be kept in sterile milk storage bags that are dated to ensure freshness. KellyMom: I'm Not Pumping Enough Milk, What Can I Do? Are There Foods That Will Make Me Gain More Breast Milk?